One of the most significant stories on the PGA Tour this year has been the emergence of Billy Horschel as one of the best golfers week in and week out.. After racking up only three top-tens in his first two largely mediocre seasons on Tour, Horschel’s earned a top-ten in seven of seventeen starts this year, missing only a single cut along the way, and earning his first Tour victory in New Orleans. His arrival to the general golf public came at the US Open where he was in the final group Saturday and finished T4. The incredible thing about Horschel’s emergence has been how poor he played in his first two years on Tour. He entered the Tour in 2010 through Qualifying School after a brilliant collegiate career at Florida, but made only four starts due to an injury. He re-earned his card in Qualifying School again, but had a poor year (+0.14 by my Z-Score Method & only 140th on the Money List). His conditional status in 2012 only allowed him to finish 147th on the Money List (-0.12 by Z-Score for PGA and Web.com rounds), but he managed to again qualify for the Tour in Q-School. So through two full seasons, he had shown himself to be roughly PGA average. In 2013, though, he’s played to -0.50 – the 18th best performance in the world. While it’s not completely unheard of for a player to improve as much as Horschel did, it is very rare. 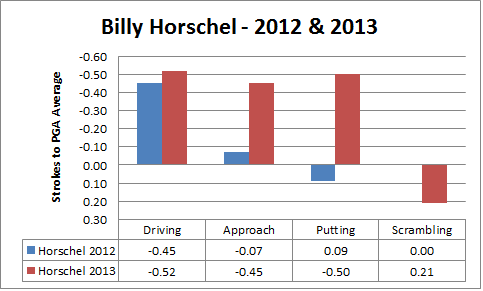 Horschel’s improvement from 2012 to 2013 was -0.39 standard deviations. That is the 19th largest improvement from one year to the next in the last five seasons, from a sample of over 800 pairs of seasons (I restricted my examination to golfers with 50+ rounds in each season). Many of the improvements ahead of him are from golfers with established high levels of performance regaining form, such as Jim Furyk in 2012, Adam Scott in 2010, Sergio Garcia in 2011, and Angel Cabrera this season. Whether due to nagging injury, personal trouble, lack of focus/preparation, etc. those guys fell from performing at a high level, but were able to regain their form the next season. Other golfers went from being extremely bad (below Web.com/European Tour average), to just mediocre. Much rarer are the genuine breakthroughs where a golfer goes from being quite average to very good. Among those ahead of Horschel, only Webb Simpson in 2011 improved from average or better to playing elite level golf. So how is Billy getting it done? What has he improved on since last season that has allowed him to earn the top 10s and maiden victory? To examine this I’m going to use what I’ll refer to as Component Stats. These are stats measuring how well a player scrambles, drives the ball, hits approach shots, and putts. To measure performance, I’ve created three of my own stats plus I’ll be using the publicly available Strokes Gained – Putting. For the other three, I’ve already introduced Adjusted Scrambling and I’ll be introducing my Approach and Driving stats in the next few weeks. For now, just remember that the stats are measured in strokes above and below the field and try to isolate how well a golfer is performing in one area by adjusting for distance of shot, starting position, and what happens in subsequent shots. By this method, in 2012, Horschel was only substantially better than PGA Tour average at driving – where he gained nearly half a stroke on the field. He was average at scrambling, slightly below average at putting, and slightly above average at hitting approach shots. In short, he was much like dozens of other Tour golfers who survive because they’re very good at one skill and good enough at everything else. What separates the elite from those golfers is the elite only have one weak spot in their game. Of the best 25 golfers by Z-Score in 2012, only Robert Garrigus ranked below average in more than one of the four statistical components. Only three of the top 50 (Ben Curtis and Lee Westwood also) ranked below average in more than one category. As long as Horschel could only rely on his driving, he was not going to be able to distinguish himself. I have no particular insight into what Horschel changed in his preparation in 2013; people have credited maturity gained from working with a sports pyschologist. What I do know is that Horschel has delivered far better performances putting and hitting approach shots this season. His Strokes Gained Putting has improved from -0.09 to +0.50 strokes this season – one of the largest improvements year-to-year – and improved by almost a half a stroke on approach shots; a total improvement of a full stroke. Horschel’s driving has remained well above average, and though his scrambling has regressed by 0.20 strokes (he’s only successfully scrambling 59% of the time despite putting lights out overall and hitting from closer lies), that hasn’t hurt him much. All in all, Horschel’s improvement has been worth 2/3rds of a stroke. A to-be-posted regression analysis shows that golfers a stroke better than PGA Tour average earn ~$65,000/tournament more than average golfers or about $1.5 million over a typical season, just to provide a financial benchmark to evaluate his improvement. The question now is whether Horschel can maintain his performance going forward. My research has shown it’s correct to regress samples of around half a season by adding 25 rounds worth of average performance. That would expect Horschel to perform at around -0.36, equal to something like the 35th best player in the world. My weighted and regressed two year Z-Score method predicts something similar. However, if Horschel has made genuine changes to his preparation and mental approach to the game, we may not be seeing a golfer playing above his head, but rather one pushing his ceiling higher.